She Who Must Be Obeyed recently purchased a dandy new camera in the Panasonic Lumix line — a series of digital wonders that have Leica glass in them and produce excellent photos. That meant she no longer needed her Canon PowerShot A650 IS and she's letting me have it. I must say it will have to do a truly excellent job to make me want to replace my old Fuji FinePix S7000. Then again, the A650 is quite a bit smaller than the FinePix and I can more easily take it with me more places. So I'm giving it a go. 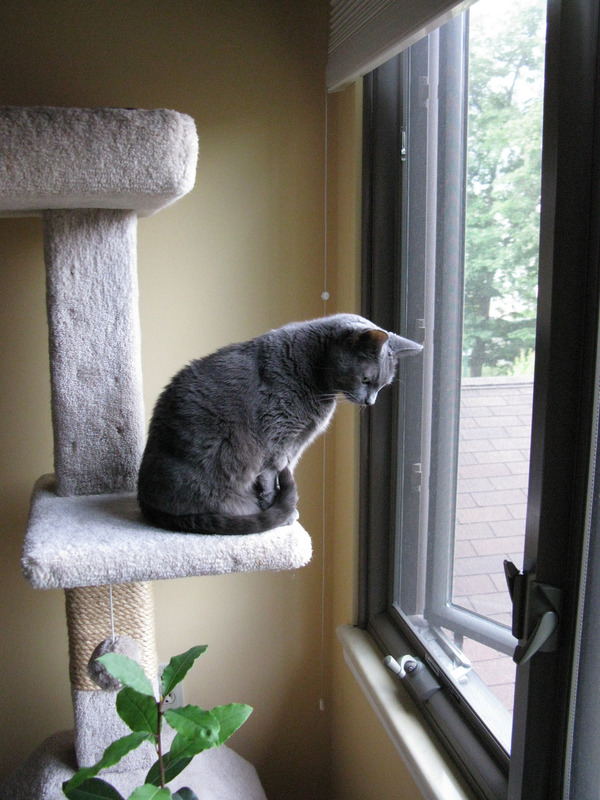 Just to get a feel for it I shot a few pictures of Tasha on her cat tree perch watching birds. There's apparently a robin's nest in the shrubbery beneath the window and the cat is tracking the birds' comings and goings. I'm not used to cameras making all settings automatically, including ISO, but I haven't turned that feature off just yet. For this picture, recorded in dim early morning light, the camera shot at ISO 640, 1/60 sec., at f/2.8. Focal length is quite short so vertical lines are distorted and close inspection reveals quite a lot of digital noise in the image. Overall the picture isn't as sharp as I'd like, perhaps because the aperture is wide open. I think I'll carry it around today and see how it goes. I know it's better than my cell phone camera and it's better than none at all for those times when you wish you had a camera. Lovely shot – it almost wouldn't matter what camera you were using. That's a great piece of cat furniture, by the way.The fuzziness… Don't forget the sensor is about half the area of your little finger-nail. Plus, all those whiskers and fine hairs, light on dark, the mesh screen in the window are all pretty much worst-case subjects for digital cameras (hence the magenta-green waves throughout those areas).But still, a great little thing to have in your pocket. My cats would like a tree like that one. They use the stairway in that manner.